Cherry and Spoon: Minnesota Fringe Festival 2018: "Swords & Sorcery: The Improvised Fantasy Campaign"
Minnesota Fringe Festival 2018: "Swords & Sorcery: The Improvised Fantasy Campaign"
Summary: An improvised fantasy play based on the rules of Dungeons and Dragons. Highlights: It's the same show as last year, but different. First of all, the Bearded Men have rebranded to the Bearded Company, because they now have some Bearded Ladies in their midst (Maria Bartholdi and Meghan Wolff), which is nice to see. Secondly, it's improv, so it's different every night, even if some of the characters are the same (which I don't know for sure, maybe that's different every night too). Dungeon Master Allen Voigt sets the stage and rolls the dice to determine how strong a requested move (kick, punch, sword strike) is. 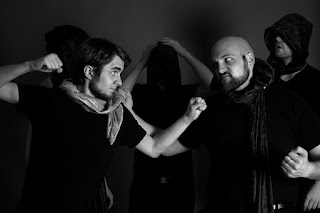 The improvises (also including Joe Rapp, Lucas Vonasek, MJ Marsh, Tyler Michaels, and Tyler Mills) create specific characters (spoiler alert: not all survive) and scenarios, all involving quests and demons to fight, while Jack Barrett improvises the always appropriate musical accompaniment on keyboard. This show is simply fun, although not so simple for the improvisers to come up with funny dialogue and cool moves on the spot. And improvised choreography has to be extra hard, but they still make it look cool (and safe). If you like improv, fantasy, D&D (confession: I only know what that is from watching Freaks and Geeks and Stranger Things), and fake sword-fighting, check out one of their two remaining shows.